Duncan Jones‘ sci-fi thriller Moon— made for $5 million (U.S.), or about 1/zillionth of the cost of Star Trek, 2012, or Avatar — won best picture and best debut director honors at the British Independent Film Awards (BIFA) held this evening in London, reports the Alternative Film Guide. 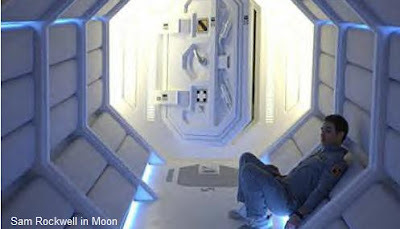 Duncan Jones‘ sci-fi thriller Moon, written by Nathan Parker from Jones’ original story (with shades of 2001: A Space Odyssey), Moon tells the story of a man (Sam Rockwell) living with a computer — that’s GERTY — at a manufacturing base on the Moon, where one day he wakes up to discover that he isn’t as alone as he thought. Worse yet, things have never actually been as he thought they were. Jones, by the way, used to go by the moniker Zowie Bowie. Why the…? Simple: He’s David Bowie’s son. Read more about the winners of British Independent Film Awards here.